The eighth edition of the Lignano SUP Race will take place on the first weekend in September at Marcello d’Olivo in Lignano Pineta. During the recent editions this competition hasachieved a great success thanks to the presence of athletes from Italy and from all over Europe. One of the goals of this race is to spread the passion for water sports, especially the SUP. Thanks to the great success of last year, Lignano decided to repeat the Festival Show. This festival is the tour of the radio that every years gathers thousands people in the italian squares. The festival boasts a large number of famous italian and international guests. This years among the most awaited guests we can find: Francesca Michielin, Sergio Sylvestre, Benji e Fede, Al Bano, Alessio Bernabei, Elodie, Francesco Gabbani and Lele. In addition to these famous singers, there will be a competition between young singers in search of success. After the italian artist Tiziano Ferro, the stadium G. Teghil of Lignano has the pleasure of opening its doors to the spanish singer Alvaro Soler who is just 26 years old and already boasts 13 platinum disks and 26 gold disks. The artist will be accompained by a special guest who will be revealed soon. 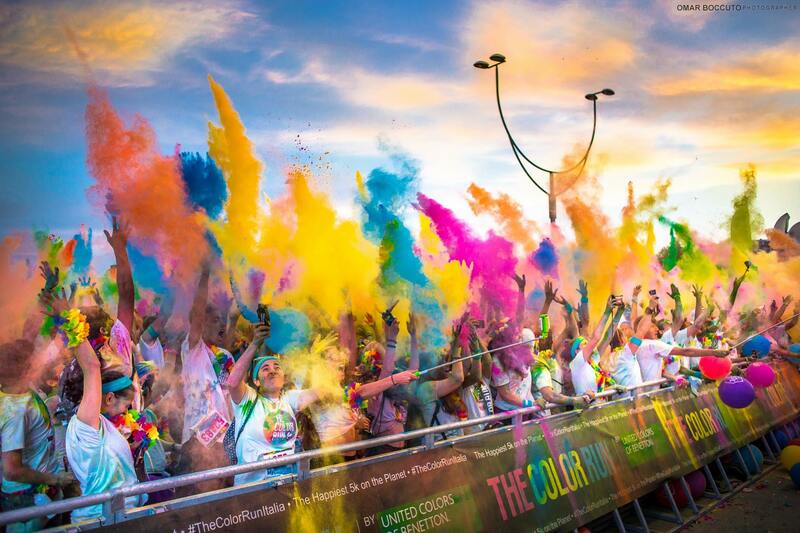 For this year is planned the second and long awaited edition of “The Color Run”. The race is famous for being divided into 4 “color points” where competitors are covered in natural and coloured powder (obtained from maize starch). At the end of the race it takes place the final festival where colours turn out to be the main protagounists again. Each partecipant is also given a “race kit” in order to make the experience funnier and unforgettable. Even this year it takes place in Lignano Sabbiadoro the traditional Frecce tricolori’s air show. On July 23rd the Italian Air Force will entertain citizens and tourists with incredible air exibitions. The aereobatics will be accompanied by colored smoke, in which we can distinguish the three colors of the italian flag. Certainly, the most crowded place will be the beach, theatre of the event: here everyone can attend the pilots’ amazing performances, that always achieve great success. From 18th to 21st May it takes place in Lignano the 31st edition of the “Biker fest”, an international event which will see the arrival of over 13000 partecipants from all Europe. During the “Biker fest” the lovers of the two-wheel motors will have the oppurtunity of attend amazing exibitions and incredible performances. the event this year will be held in the square marcello d’Olivo Saturday 3 and Sunday, September 4, 2016. Since 2010 Past editions have had record attendance, up to the edition 2015 which got well 283 athletes from from all over Europe. Most countries involved are Germany, Austria, Slovenia, Switzerland and the Netherlands, thus giving way to bring this beautiful amateur sports competition at the international level. The race Lignano SUP is a creation of society N.E.W.A a.s.d. (North East Watersports Association) who is also the organizer of the event in Lignano. • Various local sponsor and not. This event has as main objective the diffusion of water sports and the sup discipline, which in recent years as well as being a fashion is known and practiced all over the world. Seeing the result of all the past 5 editions, this year is expected a number of inscriptions will be approximately 400 atleti.Conseguentemente the NEWA you stà organizing logistically to create the biggest event of Italy, while maintaining the line non-profit. 20:00 Dinner with participants in the regatta, exhibitors and athletes-pro (for a fee in the nearby structure) and SUP RACE Lignano party with music band. 8:30 MEETING PARTICIPANTS Bic Sup One Design Kids Challenge and SKIPPER MEETING. hours 9:00 to 10:00 BATTERIES ELIMINATION Bic Sup One Design Kids Challenge. 09:30 MEETING AND REGISTRATION laggards. Departure from the beach in front of Piazza Marcello d’Olivo, Lignano Pineta (Tenda Bar). 10:00 SKIPPER MEETING SUP RACE LIGNANO. 10:15 START LONG DISTANCE. All online SUP on the beach in front of Piazza Marcello d’Olivo. The regatta will take place on the 10 km course for all types of table (path “A”) and 5 km (route “B” only for ALL ROUND). Turning point in Lignano Riviera on the stretch of sea at the Office 6.
hours 10:25 to 11:15 SEMI-FINALS AND FINAL Bic Sup One Design Kids Challenge. 11:20 FIRST ARRIVALS SUP RACE LIGNANO. 13:00 Pastasciutta THE TENT AND LELE’S KIOSK. Times are approximate and may be subject to small changes. After the last edition held in Jesolo We are pleased to present the new edition of the Winx Worldwide Reunion to be held in Lignano Sabbiadoro 2 to 4 September 2016 ! The event will bring the values and happiness among the smallest , one of the points on which it was born has always been this series , but also friendship , commitment and selflessness . For these three days of happiness small fans will enjoy following the mythical fairies " Winx " , carrying with them the small group activities and attend magic shows. The last edition took place in Jesolo joined fans from 25 countries of the world .